The Imorgon system enables sonographers to perform exams more efficiently, increasing the quality of communication with radiologists. Images and clips are presented, interleaved, in acquisition order to the radiologist—exactly as the sonographer intended. Built-in Quality Control (Q/C) tools help eliminate confusion, errors and impromptu workarounds. These tools also reduce calls to PACS staff for help in correcting errors. 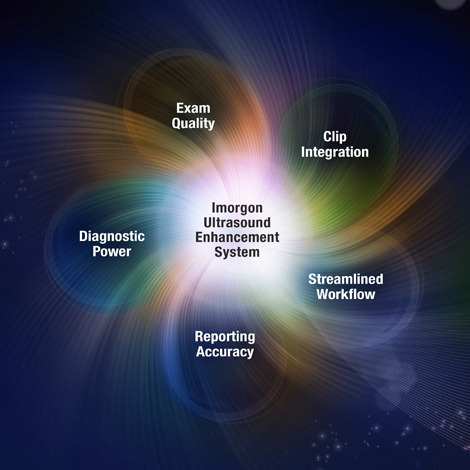 With the Imorgon System, the overall management of ultrasound exams and reports becomes simpler and quicker. Still images and clips are presented in interleaved, acquisition order for more logical and efficient review. Electronic forms replace handwritten paper ones, eliminating redundant and error-prone dictation of exam calculations and measurements. Other system features that improve exam efficiency include in-progress review and automatic image and clip updates. A major advantage of the Imorgon System is that it displays ultrasound images and clips on the PACS workstation in interleaved, acquisition order. This means exams are presented as the sonographer intended, without forcing the physician to mentally reconstruct the exam or make assumptions about the data, thus providing a more logical, easy-to-follow study presentation. Clips launch automatically and play at true frame rates and runtimes, leading to more accurate assessments of anatomical orientation and physiological function. This reduces the chance of overlooking pathology and facilitates quicker “normal” exams. By preventing errors and improving the overall ultrasound exam management and reporting process, the Imorgon System ultimately helps radiology departments deliver a higher level of patient care for a reduced cost per study.